Top Quality Glass Coated Optics - 100% Guaranteed to Please ! Smart silver metal and black rubber armoured body combined with really precise and clear viewing optics. 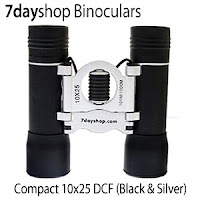 Powerful 10x magnification combined with their very compact size make these binoculars an excellent choice for viewing many pursuits including sports, walking or hiking, motor racing, aircraft displays, horse racing and bird watching too. Fits in a larger coat pocket and because of their compact size and weight, are more than ideal for travelling with. Keep a pair handy in the cars glove box or in your rucksack, camera bag etc. and etc. - you'll be glad you did ! Field of View 101m at1000m. Supplied with a padded nylon case, built in neck-strap and even a small lens cleaning cloth too ! 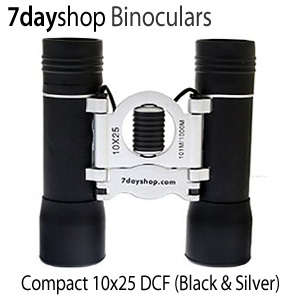 My job means I'm in the Scottish Highlands a lot and need decent compact binoculars.The optics on these are pretty good - clearer than my equivalent Practika ones and better than the Tesco branded ones (both more than twice the price of these). The design and build quality are easily the match of the (£15) Practika and better than the Tesco one's ,giving the overall impression of a solidly built product. The problem with these is that the're more difficult to focus than the Practika - it takes longer - and I seem to spend more time getting the interpupiliary distant right. However, in terms of value for money, I doubt if there is a better pair of compact binoculars on the market.